The tolerance of the Parliamentary Assembly of the Council of Europe (PACE) towards the extreme right revanchist rhetoric during its sessions is disgusting and totally unacceptable. 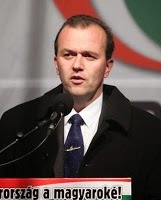 On 9 April 2014, Jobbik's MP Tamás Gaudi Nagy made a 3-minute speech against European democracy, and even when the hateful nature of his speech became obvious, he was still allowed to continue. In particular, this Hungarian fascist - wearing a T-shirt saying "Crimea legally belongs to Russia! Transcarpathia legally belongs to Hungary!" - stated that "Ukraine is an artificial country" and that Transcarpathia should be "returned" to Hungary. On 28 March, the same fascist Gaudi Nagy organised a 200-300 strong demonstration in front of the Hungarian foreign ministry in Budapest, with participants carrying banners saying "Autonomy for Transcarpathia!" and "Hungary wants Transcarpathia back!". The same Gaudi Nagy has recently thrown EU flags out the window of the Hungarian parliament. Why the PACE has completely ignored all these anti-European, anti-democratic acts is beyond comprehension. Jobbik is an anti-EU, right-wing extremist party which obtained 20.54% of the vote in the parliamentary elections held on 6 April 2014. 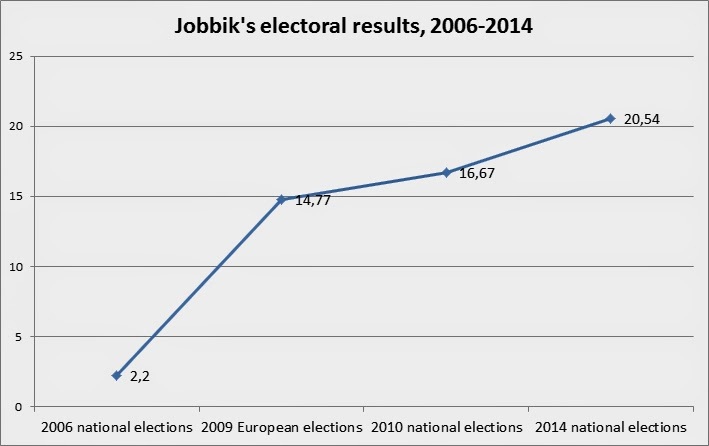 Jobbik's result in 2014 is 3.87% more than it obtained in the 2010 elections. And here's a chart of Hungarian fascists' electoral rise. Jobbik is also a pro-Kremlin organisation, and the weight of evidence suggests that it is being supported by Moscow's far right government. Hungarian fascists visited Russia several times. In May 2013, the party's leader Gábor Vona was invited - together with Jobbik's MEP and Treasurer of the extreme right Alliance of European National Movements Béla Kovács - by Russian fascist Aleksandr Dugin to the Moscow State University where Vona delivered a lecture titled "Russia and Europe". In his speech, Vona called the European Union “a treacherous organisation” and declared that it would be better for Hungary to join the Russia-dominated Eurasian Union should occasion arise. At the same time, Kovács was one of the "observers" in the illegal Crimean "referendum" in March 2014. Apart from the Scottish National Party, all these parties are either radical right-wing or explicitly neo-Nazi organisations. Some Russian proposed guests include Vladimir Zhirinovsky's far right Liberal-Democratic Party of Russia, Gennadiy Zyuganov's National Bolshevik Communist Party of the Russian Federation, as well as notorious Russian fascists such as Aleksandr Dugin, Mikhail Leontyev, Aleksandr Prokhanov and Eduard Limonov. "Formation of new united national doctrine of Russia and Europe"
"Unification of all the healthy forces of Europe against breaking of national identity"
"Common fight for national rights and national states"
The Kremlin is clearly building an anti-Western, anti-democratic "Fascist International" right in the EU's own backyard, while the European democrats turn the blind eye to the rapid fascistisation of the Russian state and society. The Ukrainian Svoboda and Right Sector must be feeling right brassed off with most of their European co-thinkers siding with Russia. All they've got as pals are the Baltic States fascists, the Polish ultras (despite there being some unfinished business between Ukraine and Poland), and a few Swedes. Интервью для Deutsche Welle о "Правом секторе"